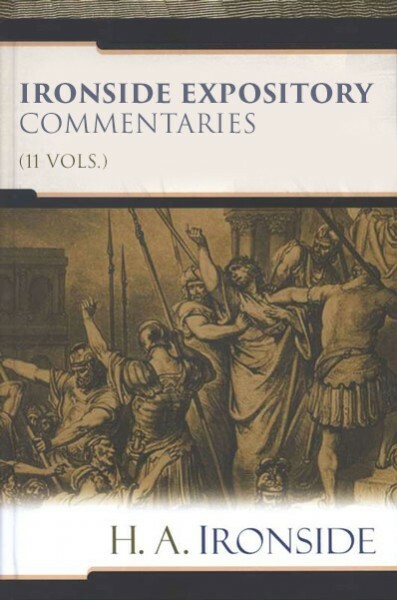 This collection of Bible commentaries by H. A. Ironside, originally published in separate volumes, is a highly useful tool for students of God's Word. The Ironside Expository Commentaries not only contain solid biblical exegesis that has stood the test of time, but are also filled with practical applications and spiritual insights. Ironside uses his commentary not just to provide biblical knowledge, but also to provide a window into what that knowledge means to our world and lives. For example, when commenting on John 13, he expounds on Christ's love: "If you and I have the mind of Christ, this divine love will be manifested in us. If it is not, then all our talk...about standing for the truth goes for very little indeed." Henry Allen Ironside (1876-1951), considered one of the twentieth century's greatest preachers, was also a prolific writer. With only an eighth grade education, Ironside became a Captain of the Salvation Army by age 18. Living by faith in God's provision, "HAI" preached widely throughout the United States and abroad. For eighteen years he was pastor of Moody Memorial Church in Chicago. In his prime, he traveled 40 weeks a year, but always made it back in time for Sunday. The self-taught, or rather God-taught, preacher was eventually awarded two honorary doctorates. In all, he wrote fifty-one expositions on Bible books, including all of the New Testament books and many of the Old.